Born: 29 July 1852, Harrow, Middlesex, England. Frank W. Waldron, associate member of the (British) Institution of Civil Engineers, came to the Cape Colony in 1876 and was employed in the Public Works Department for almost his entire career. He was initially appointed as assistant to the resident engineer of the Port Alfred harbour works in May 1876 and was put in charge of these works in December 1887. In September 1890 he was appointed assistant engineer at the East London harbour works. Four years later, in May 1894, he was transferred to Cape Town. From March 1902 to 1905 he was stationed at Mossel Bay as resident engineer to the Mossel Bay Harbour Board, but then returned to his previous post in Cape Town. In July 1906 he became inspecting engineer in the Public Works Department, a post he held until he left the Cape civil service around 1908. In 1913 he resided in Mossel Bay, but the next year was acting harbour engineer at Durban. Waldron was interested in scientific pursuits. In 1885 he and W. Carr presented a collection of marine invertabrates from around Port Alfred to the Albany Museum, Grahamstown. The collection contained 144 mollusc shells, including the scarce rock borer Pholas dactylus and two examples of the cuttle fish Sepia officinalis, as well as an extensive series of sponges. They also provided the museum with its first specimens of the Cape Sand Shark. Waldron presented a further collection of molluscs from the same region in 1887. He became a member of the South African Philosophical Society in 1900 and remained a member to 1906. On 1 August 1900 he read a paper before the society on the appearance and disappearance of a mud island at Walfish Bay. The island was first spotted by Miss Cleverly, daughter of the local magistrate, on 1 June. Its size was about 50 m by 10 m by 5 m high, and it was situated directly landward of Pelican Point, in water about 7 m deep. The island's sides were steep, and were being eroded by the waves. A strong odour of hydrogen sulfide was noted. By 7 June the island had disappeared. Waldron's account was published in the society's Transactions (1901, Vol. 11, pp. 185-188), and in Germany by the geologist Adolf Schenck* during the same year. Waldron was an early member of the Cape Society of Civil Engineers (founded late in 1902). In 1904 he combined his work as a harbour engineer with his interest in molluscs and published a paper on "The destruction of timber on the South African coast by marine wood-borers" in the society's Minutes of Proceedings. In 1909 he served as joint vice-president of the society and contributed two more papers to its Minutes of Proceedings: "The construction of Robben Island jetty head with reinforced concrete" and "Reinforced concrete bridge on the Kowie River, Port Alfred". 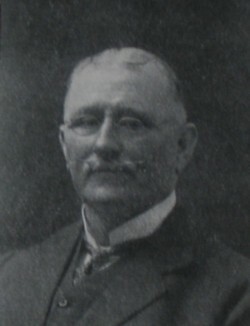 He was still a member of the society's successor, the South African Society of Civil Engineers, in 1913. In 1907 he became a member also of the South African Association for the Advancement of Science, serving on the committee for Section B (which included engineering) at the association's annual congress in Grahamstown in 1908. At that meeting he read "Some notes upon the application of reinforced concrete", which was published in the association's Report (1908, pp. 67-73). Cape of Good Hope. Civil service list, 1896, 1899-1908. Cape of Good Hope. Report upon the Albany Museum (title varies), 1885, 1887. National Automated Archival Information Retrieval System (NAAIRS). . Documents relating to Waldron, Frank William / Waldron, F.W. South African Philosophical Society. Transactions, 1900-1902, Vol. 11, paper by Waldron; 1906, Vol. 16, list of members.